1966 – Death of Giles Stannus Cooper. 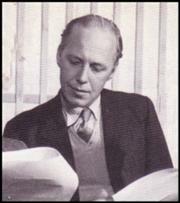 Giles Stannus Cooper OBE (9 August 1918 – 2 December 1966) was a prolific radio dramatist, writing over sixty scripts for BBC radio and later television. He was awarded an OBE for “services to broadcasting” in 1960. A dozen years after his death at only 48 the Giles Cooper Awards for radio drama were instituted in his honour, jointly by the BBC and the publishers Eyre Methuen. Giles Cooper was born into a landed Anglo-Irish family at Carrickmines near Dublin on 9 August 1918, the son of a Royal Navy Commander, Guy Cooper. He was educated at the prep school Arnold House, St John’s Wood, London, at Lancing College on the South Downs, and later studied languages in Grenoble in the French Alps and at a language school at San Sebastian in Northern Spain. It was here, with the Spanish Civil War raging around him, that he was shot through the arm one evening by a sniper’s bullet while on a mission to purchase cigarettes before dinner. The Royal Navy subsequently came to his rescue, gave him medical attention and dropped him off across the French border at St. Jean de Luz. His father had planned for him the life of a diplomat, in which a Cambridge degree in Law and a Call to the Bar were prerequisites. Cooper, however, confounded these plans by enrolling as an actor at the Webber Douglas Academy of Dramatic Art in London. A contemporary, joining on the same morning was the actor Michael Denison who recalls their first meeting in his autobiography Overture & Beginners. Cooper’s studies were interrupted by the Second World War. Initially conscripted into the ranks, he was selected for training at the Royal Military College Sandhurst, gained a commission and was subsequently despatched to the Far East. He served as an infantry officer in the West Yorkshire Regiment, spending three grueling years in the jungles of Burma fighting the Japanese, on occasion hand-to-hand. After the war he worked as an actor, first at the Arts Theatre under Alec Clunes, where he met his future wife, the actress Gwyneth Lewis. Seasons in repertory theatre at Newquay (with Kenneth Williams) at the Connaught Theatre, Worthing (with Harold Pinter) and at the Regent’s Park Open Air Theatre continued until 1952 when he turned to script editing and then full time writing. Cooper was a pioneer in writing for the broadcast media, becoming prolific in both radio and television drama. His early successes included radio dramatisations of Dickens’ Oliver Twist, William Golding’s Lord of the Flies and John Wyndham’s classic science fiction novel Day of the Triffids. Wyndham wrote him a congratulatory letter after the first broadcast. On television he adapted Simenon’s Maigret detective novels from the French, which became the major hit of the day (1960-61) starring Rupert Davies as the pipe-smoking sleuth in over 24 episodes. Cooper also adapted four Sherlock Holmes stories, Ernest Hemingway’s For Whom the Bell Tolls (1965), Les Misérables, Flaubert’s Madame Bovary and Evelyn Waugh’s Sword of Honour (1967). He was also successful with his own plays. His first full-length play Never Get Out was staged at the Edinburgh Festival in 1950 and transferred to the Gate Theatre in London. The first of his radio plays to make his reputation was Mathry Beacon (1956) about a small detachment of men and women still guarding a Top Secret “missile deflector” somewhere in Wales, years after the war has ended. Also of note are Unman, Wittering and Zigo (1958) in which a young teacher finds his predecessor has been murdered by the boys in his class) and The Long House (1965). “Out of the Crocodile” ran at the Phoenix Theatre in 1963-64 starring Kenneth More, Celia Johnson and Cyril Raymond. “The Spies are Singing” was presented at the Nottingham Playhouse in 1966. Many of his plays were later adapted for both stage and television. Unman, Wittering and Zigo, Seek Her Out (in which Toby Robins witness an assassination on the London Underground and becomes the next would-be victims of the perpetrators) and The Long House formed a trilogy in broadcast on Theatre 625 on BBC2. He also wrote The Other Man a television drama starring Michael Caine, Siân Phillips and John Thaw and first broadcast on ITV in 1964. Everything In The Garden was first performed by The Royal Shakespeare Company in 1962 at the Arts Theatre, London, an American adaptation by Edward Albee, dedicated to the memory of Giles Cooper, was first performed in 1967 at the Plymouth Theatre, New York. His last play was Happy Family which was first presented at the Hampstead Theatre in 1966 starring Wendy Craig, it then transferred to the West End with Michael Denison, Dulcie Gray and Robert Flemyng. A revival in 1984 directed by Maria Aitken, opened at Windsor and transferred to the Duke of York’s theatre in the West End, starring Ian Ogilvy, Angela Thorne, James Laurenson and Stephanie Beacham. Cooper, OBE (and BAFTA equivalent-winner for Maigret) died at the age of 48 after falling from a train as it passed through Surbiton, Surrey returning from a Guild of Dramatist’s Christmas dinner at the Garrick on 2 December 1966. A post-mortem showed he had consumed the equivalent of half a bottle of whisky and the coroner at Kingston in January 1967 returned a verdict of misadventure. There have been several attempts to attribute his death to suicide, notably by The Stage, the theatre’s newspaper, and by Humphrey Carpenter in his history of the BBC. Cooper’s family, understandably perhaps, have always strongly refuted this, not only because it bears no relationship to the playwright’s apparent frame of mind during the period leading up to his death, but because it unfairly colours appraisal of his work from an academic standpoint. In 1978 the Giles Cooper Awards for radio drama were established by the BBC in conjunction with the publishers Eyre Methuen, and until their discontinuation under Birtist belt-tightening in the early 1990s, were awarded to a plethora of writing talent, including Tom Stoppard, Harold Pinter, Anthony Minghella, Fay Weldon, Joanna Trollope and William Trevor. 1783 – Death of Thomas Burke. 1998 – Death of Mary McShain at Killarney House, Killarney, Co. Kerry.